Ahead of the German Parliament’s debates on military spending, Angela Merkel has said that raising funds up to NATO’s required 2 percent of GDP is "not beyond the imagination." Germany’s failure to meet the demand has been an apple of discord between Berlin and other alliance members, foremost Washington. Speaking to top army officers, the head of the German government has promised significantly higher military spending in the next few years. She pointed out that NATO’s requirements, pushed by Germany’s allies, to spend 2 percent on defense wasn’t "completely beyond the imagination." At a gather she last attended six years ago, Merkel said that this was about the credibility of Germany. She also addressed the concerns of those who oppose higher military spending and their narrative suggesting that progressing towards the 2 percent target could lead to the militarization of Germany." According to the chancellor this is an issue of necessity. "The people with proper expertise… of course know that this 2 percent is not some kind of fetish that has nothing to do with our Bundeswehr. Rather, they know that such a sum is necessary to meet our international tasks and to provide domestic defense," said Merkel, cited by the AP news agency. She stressed that the world is becoming more uncertain, complicated by an unclear balance of power. 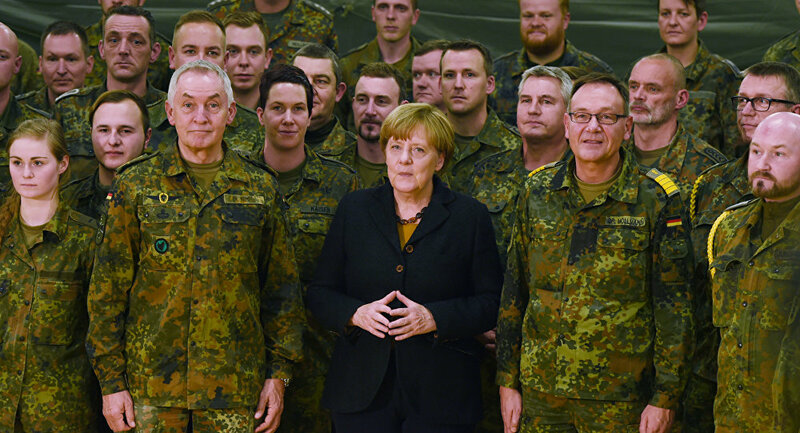 Merkel recalled that the German government earlier provided 2.3 percent of its GDP (gross domestic product) for military expenditures according to recommendations from the alliance. The current spending on the Bundeswehr equals 1.24 percent of GDP, although in 2014 Germany was among those NATO states, which committed itself to 2 percent target. Germany's Defense Minister Ursula von der Leyen, who spoke at the meeting along with Merkel, pointed out German’s total input, noting that Berlin has a higher number of troops than many other allies. She has also insisted on more funding. “By the NATO summit in Brussels, we will show that we want to achieve a 1.5 percent share of defense spending by 2025," von der Leyen revealed. However, speaking about NATO guidelines, she also added that the financial figures should not be the only focus. With the world’s ninth-highest military budget, Germany will provision 38.5 billion euros on defense this year; in 2019 this number will rise by more than 2 billion euros, up to 41.5 billion. These announcements have come just a day before Germany’s parliamentary debates on defense spending. Earlier, the 2 percent increase had been blocked by the Social Democratic Party, which Merkel’s Christian Democratic Union had to partner with to build a new government, in the coalition agreement. This has faced strong criticism among Germany’s NATO allies, first of all the US. Washington, which according to NATO’s stats, spends 3.6 percent of its GDP, insists that its partners should reach the agreed guidelines by 2024 at the latest. Donald Trump has long bemoaned the situation within the alliance, when only 5 of 28 members follow the 2 percent guideline and repeated his criticism following talks with Merkel this April. “Other countries should be paying more, and I’m not saying Germany alone. NATO is wonderful but it helps Europe more than it helps us, and why are we paying a vast majority of the costs?” Trump said, commenting on the issue.